Biomani Scientific SkinCare has perfected the impact between science and nature with new unique firmulations that even the most discerning clientele can appreciate. Formulated for all skin types, Biomani products delover targeted results including immediate hydration, nourishment and long-lasting suppleness that powerfully reduces the visible signs of aging. In addition, Biomani products are formulated to treat and improve skin imperfections such as Acne, Rosacea, Pigmentation, Melasma, Eye Area problems and fine Lines. Your skin is unique, because its behavior is unique. For the last 30 years, the dermatological laboratory of Biomani Scientific SkinCare has been carrying out a program of research, supported by clinical observations as well as advanced medical knowledge. Its finding have given Biomani Scientific SkinCare a precise understanding of the multiple factors governing skin behavior, health and regeneration as well as the technical means of identifying them. Biomani products opened up a new era in therapeutic and medical grade cosmetics. The products are formulated by our medical team and physicians, based on a more detailed understanding of the skin, their action target and in response to the specific needs of every skin. It is every woman's desire to make the most of herself, to look youthful and to feel confident in her appearance, rendering herself more prepossessing to others. With that in mind, Biomani's approach to skin care is to be individualized and ideally suited to your personal skin care regimen. 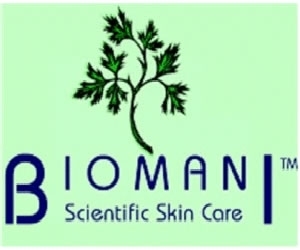 With passion for delivering the world's most therapeutic facial treatments, with passion for the world of botanical oils and extracts that nourish and restore the beauty of skin, Biomani Scientific SkinCare have achieved authenticity through products that provide precise and customized skin care.